I don’t usually have a particularly sweet tooth, and I also tend to find Asian desserts to be a bit ho-hum. But Singapore and Malaysia may have changed those opinions forever, because the world of kueh has opened up for me. It all started in Singapore, where Kenny suggested that we buy some little cakes right after our massive blow-out meal at Chomp Chomp. We laughed, because really we couldn’t have eaten a wafer thin mint at that point. 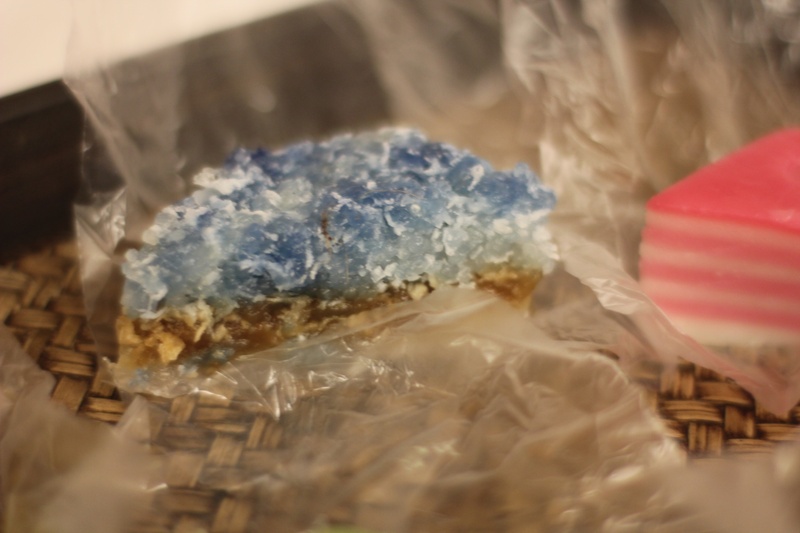 But Kenny insisted that we take some back to our hotel, so we bought two tiny, jewel-like green cakes. And sure enough, an hour later, in our hotel room, we thought why not, they’re very small…They proved to be absolutely delicious morsels, combining sweet sticky rice, coconut custard and pandan layers. When I reported this back to Kenny, he said that Singaporeans have a finely-tuned sense of when the human body will be ready to ingest just a little more food. It turned out that this scene – Lemurs in hotel rooms, decadently stuffing delicious cakes in our already overfull mouths – would replay over and over again throughout our travels. We did the same thing in Kuala Lumpur, where we bought some unassuming looking kueh from a coffee stall in the central market. 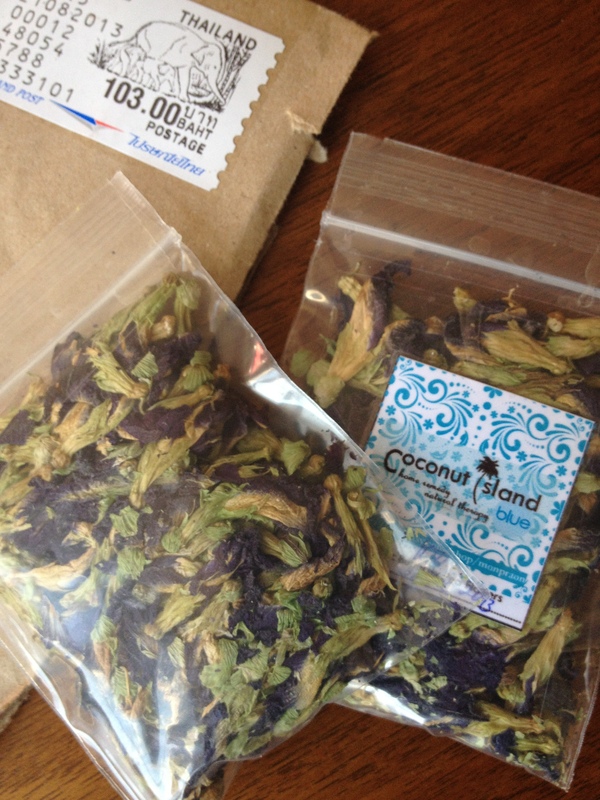 We suspected they would be mediocre, maybe even mass produced, since the stall mostly sold iced coffee to tourists. And yet, when we got them home, they were astonishing: luxurously custardy, soft, sweet but not too sweet, with an aromatic pandan flavour. There we were again, lying on our corporate hotel bed, revelling in the air conditioning and marvelling at the deliciousness of kueh. By the time we hit Malacca we had moved finding kueh to the top of our priority list in a way that was frankly shameful. Like addicts, we could stop any time, we just didn’t want to. So more or less as soon as we arrived, we were making our way through the Jonker Street market buying up all the kueh we could find. It didn’t help that the stalls basically give you a tray and invite you to pile it up with as much kueh as you want. That’s how the situation you see in the photo above happened. We went back to our hotel and just spread them out on the bed. There are a million different types of kueh and mostly, to be honest, we didn’t even know what they were as we shoved them into our gaping maws. But one thing sets aside Malacca’s kueh – gula melaka, the delicious amazing palm sugar that’s named for it. 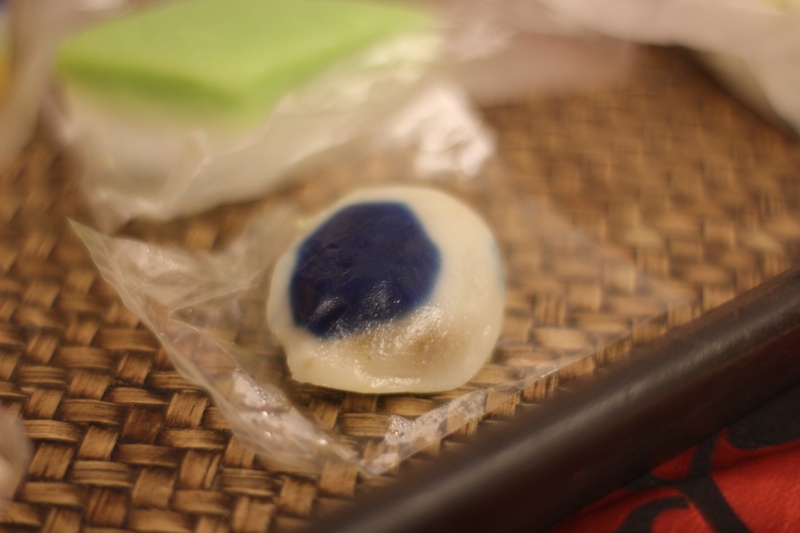 This eyeball thingy was made of sweet rice dough, stuffed with a melting centre of gula melaka. It was unbelievably good. You can see the deep brown gula melaka layer in this one, which was nicely coconutty. On the right is pink and white striped kueh lapis, which is a layer cake made from rice and tapioca flour also recommended by Kenny. The one on the right here is the same type that we had in Singapore and in KL: a layer of sweet coconut milk sticky rice topped with pandan custard. 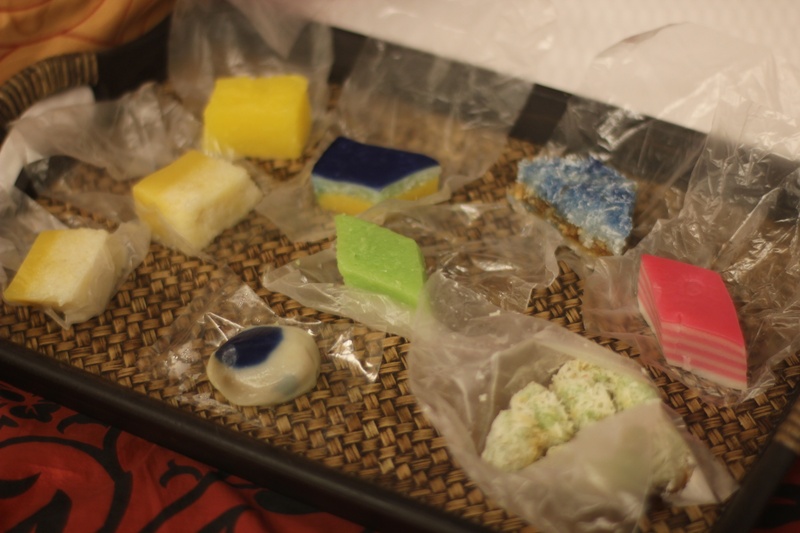 It might be my favourite genre of kueh, although this one wasn’t as good as those earlier iterations. 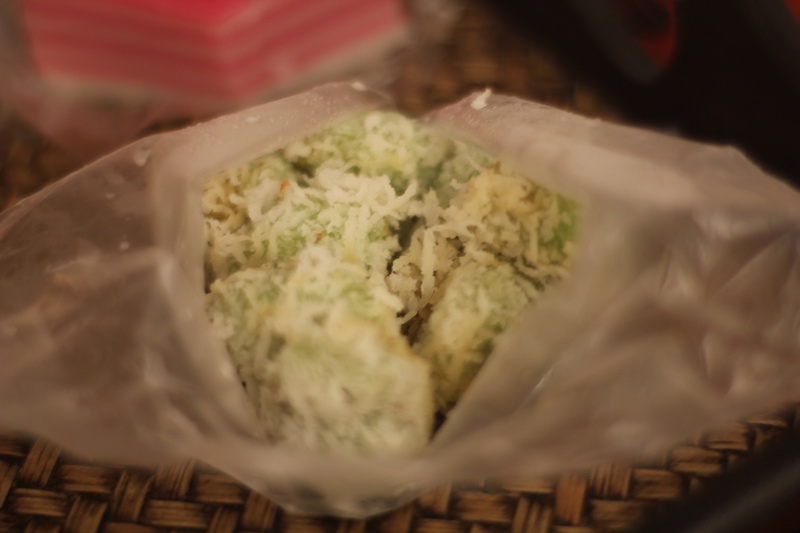 But the best of all were these onde onde – little balls of rice dough filled with gula melaka and rolled in coconut. We were actually on our way home, laden down with kueh, when I saw a stall where an old woman was boiling onde onde fresh. It had the look of a place that I absolutely had to eat at: food being cooked fresh, check; a vendor who only makes and sells one thing, check; and a bit of a wobbly home-made affair, check. The woman was mad at me for not having correct change, but luckily a passerby helped me make change and we went home with a hot little package of fresh! onde onde. ZOMG. I cannot express how good these were. The gula melaka was caramelly, smoky goodness that poured out when I popped these little babies in my mouth. Mr Lemur and I just lay on the bed stupefied like we were in an opium den in a silent film. 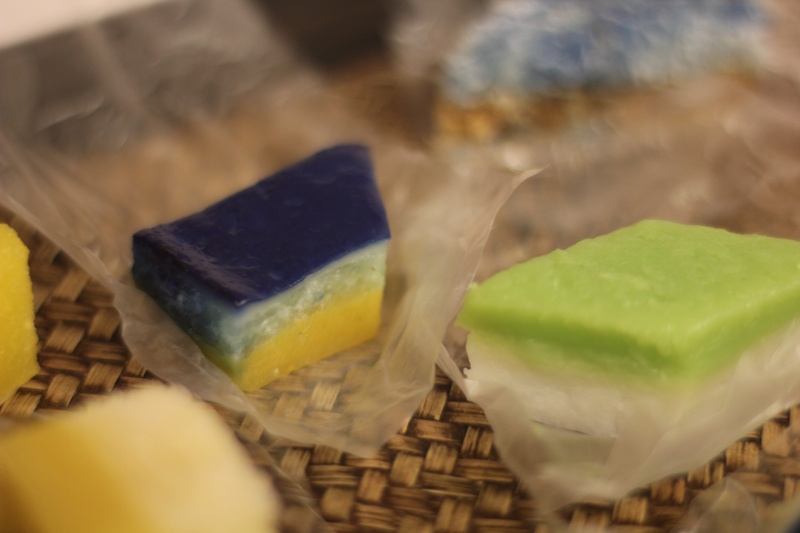 There are a lot of kueh that we don’t have pictures of – all of the ones in Singapore and KL we basically monstered through before we even thought of photography. And then there are the kueh we never got to eat. We tragically failed to find the amazing kueh vendor on the outskirts of a suburban market in KL recommended to us by Robyn. Because it was hari raya, he was taking his only weekend off in the year. The same thing happened in Malacca with the sweet potato and gula melaka doughnut vendor, also on vacation. I’m embarrassed even to tell you how much time we devoted to searching out these stalls. Worse still was Baba Charlie, who was open, but by the time we arrived had nothing left but durian pancakes. (We bought them anyway but threw them out once we tasted them. I really can’t do durian.) As befits our sordid kueh addiction, we wasted a lot of time looking for our next hit. Looking so forward to the home-made kueh recipes!